On Saturday I was in Illinois for a bridal shower. I was put in charge of games, which in my experience seems to be the job given to out-of-towners. I've done games at a few showers now, and let's be honest: bridal shower games can get old quick. So I went on the hunt for an original game, and Martha Stewart did not disappoint. 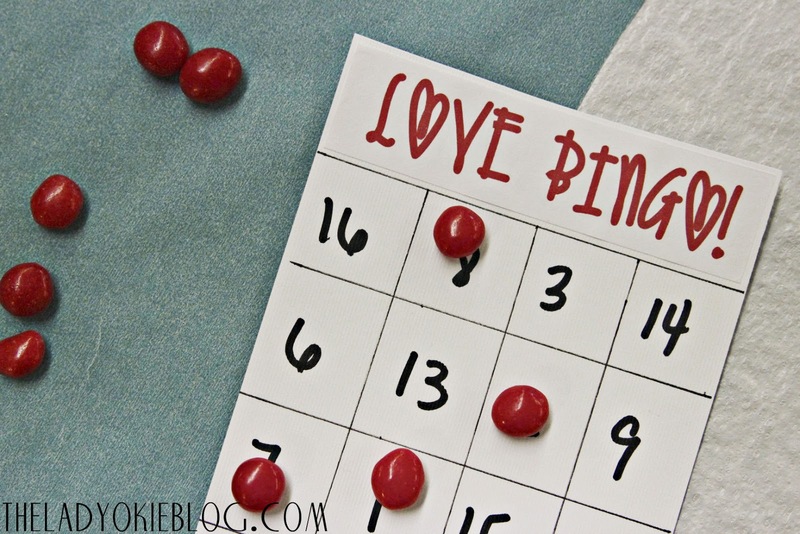 This game is called Love Bingo and was a lot of fun! I got multiple compliments from guests about how creative and fun the game was. > Create squares of 16 on card stock. Number the boxes randomly 1-16. >Create paddles, two for each guest, using popsicle sticks and cardstock. 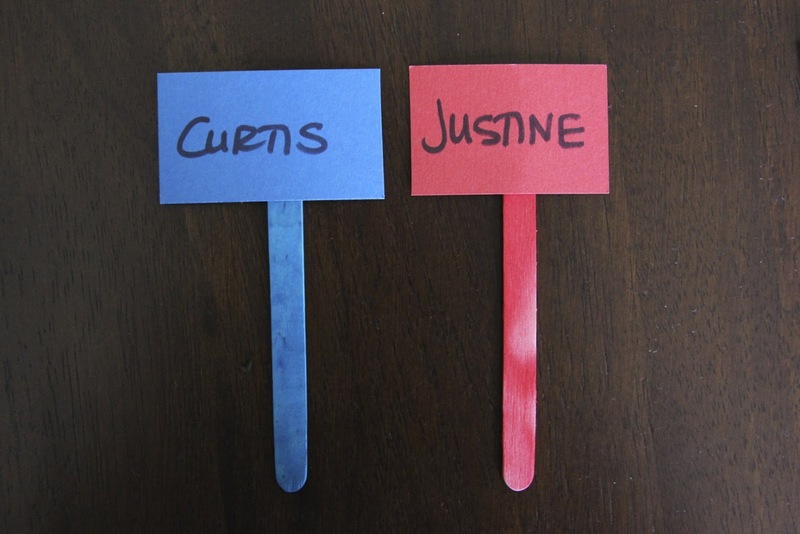 Write the bride's name on one and the groom's name on the other. 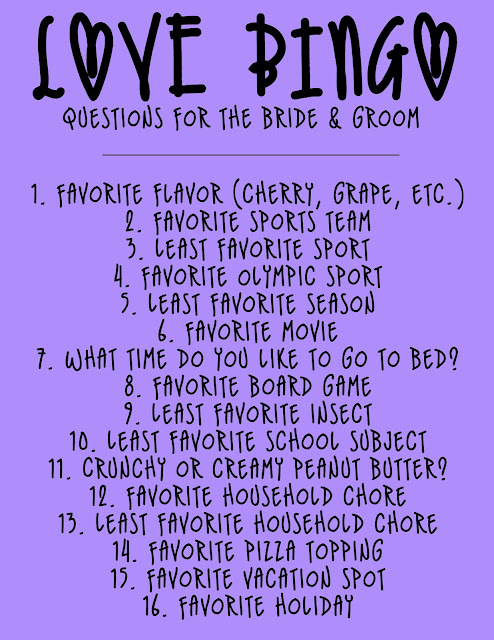 >Ask the bride and the groom the same set of 16 questions. Then, number slips of paper 1-16 and write one question on each paper with the answer for either the bride or the groom. So, for example: one question could be: What is your favorite color? The bride says red and the groom says green. On the paper numbered 4, you write: Favorite color is red. Obviously this is about the bride. So, guests hold up their paddles to show what their guess is: bride or groom. If they're right, they get to put a marker on their BINGO card on number 4. The paddles make it fun because everyone can see who's guessing bride or groom. For square markers, I was going to use Smarties, but the store was out. (OUT of Smarties. Weird.) So I got a few bags of Red Hots, which I said was the "red hot" love. That got a few chuckles. 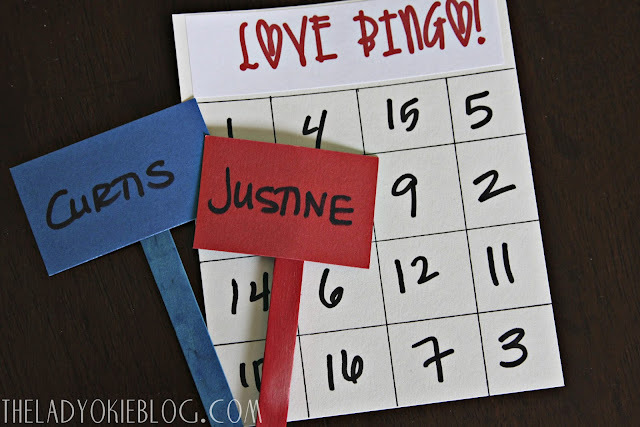 Love BINGO was a really fun way to learn about both the bride and the groom, and everyone loved it! I saved all the BINGO cards so I can play this again at another shower. Here are two list of questions you can use to play a Love BINGO game of your own! These weren't easy. In fact, even the bride's and groom's mom got some questions wrong. I love this!! My bridal showers are right around the corner, and I will be sending this post to the hosts for sure. Awesome, awesome post! I'm in the midst of planning my sister's bachelorette party and I think I will include this game! Thanks for the great idea! do you know you have an obscene video pic in the middle of you blog? just thought I would let you know... oh and the love bingo is cute by the way.. love it! into the Bridal Shower Invitations. Thanks for the inspiration! Their staff did an excellent job at our party. My wife and I are busy, working professionals and have a high standard for customer service and a very low tolerance for incompetence and lack of creativity. Hello! I like this game, however I am helping to plan a bridal shower for approximately 50 people. For those of you who have played this game, would you recommend modifying it for a larger party? For example, I was thinking of having 50 numbers (50 questions) instead of 16 and each guest would have a combination 16 of different numbers on their card from 1-50. Thank you! You could certainly modify the number for as large of a group as you have. I've played this game as is (16 questions) with probably around 25 people. I don't know that you would necessarily want as many as 50 questions. That might take a long time for anyone to get a bingo. Just something to consider! I hope that helps! Does the bride play too? Good question. The bride is going to know most if not all of the answers, so if she plays people will just copy her. 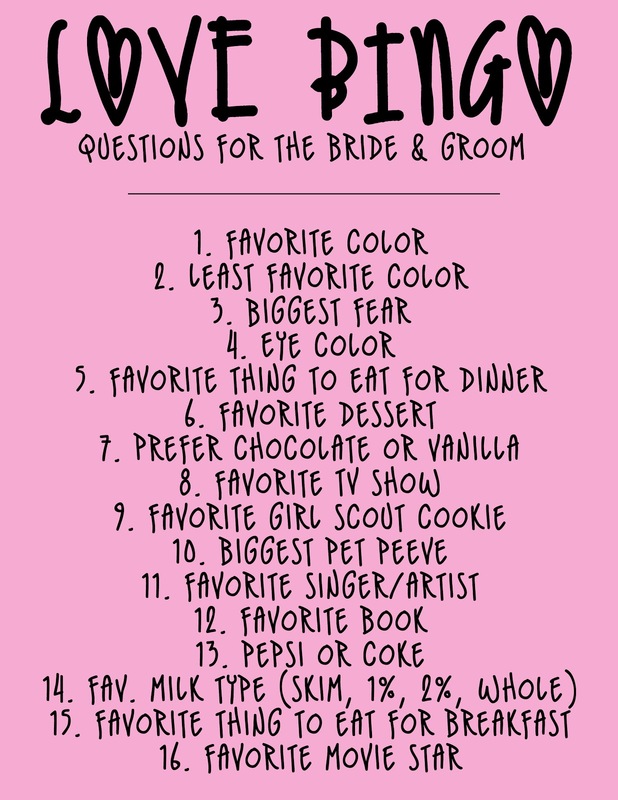 What I recommend is having everyone hold up their answer first and then the bride can hold hers up and you (holding the answer) verify that she's right (which she usually is). So she acts as kind of the answerer to the questions and she can certainly fill out a bingo card if she wants! One more question haha would you have the guests fill in their own bingo card 1-16? I made all the bingo cards filled in with numbers in advance of the game, and they are all different (so obviously the whole group isn't getting bingo at once). 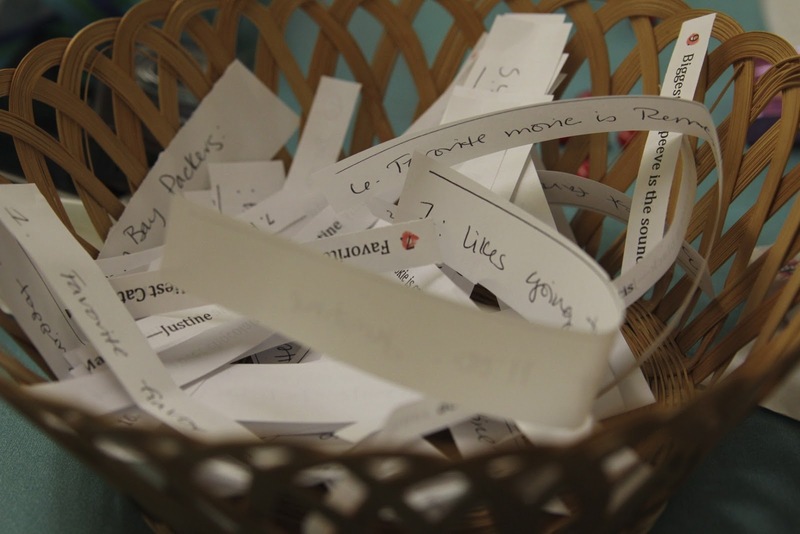 But I guess if you wanted, people could just fill in their own card with the numbers.